Whoops! We over-stocked this sauce - and the best by date is 7/19/19. We'd hate to throw it all away, so we're offering Granny's at a discount for a limited time. Take advantage of this special pricing before it's gone! If Granny's BBQ Sauce could win an Oscar, it probably would. 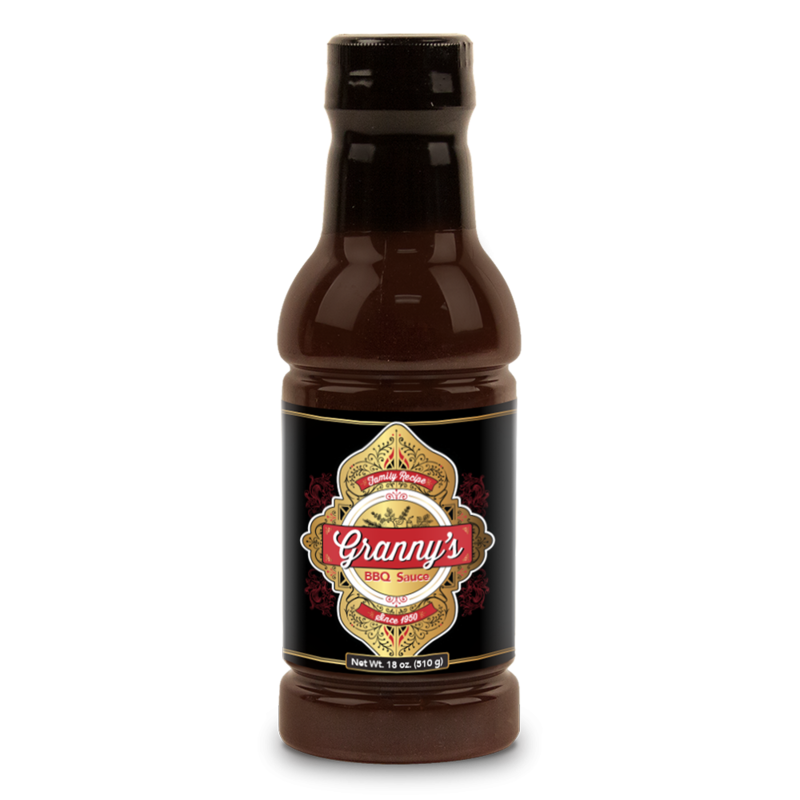 Granny's BBQ Sauce is the one of the most recognized and award winning sauces on the market. This old family recipe has taken over the competition circuit - With numerous perfect scores this BBQ sauce is perfect on anything! Our customers love Granny's BBQ sauce on pulled pork, bbq brisket, chicken, and ribs. Featuring a blend of spices, orange marmalade, brown sugar, and peach preserves; Granny's BBQ Sauce is aiming to become your favorite go-to bbq sauce. This 18oz bottle of Granny's BBQ sauce is the perfect starter size if you haven't tried this sauce before. Check out the Granny's BBQ sauce in 1/2 sizes and gallon sizes if you're a little more serious about your love for Granny's BBQ sauce. 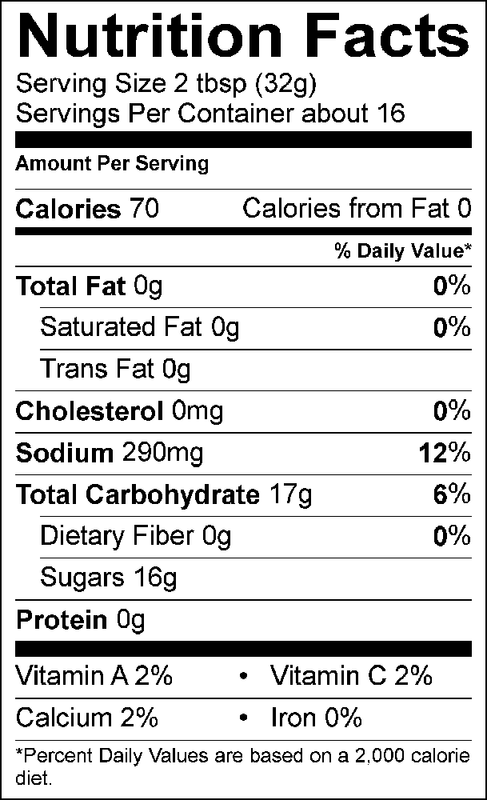 Brown sugar, ketchup (red ripe tomatoes, distilled vinegar, high fructure corn syrup, corn syrup, salt, spice, onion powder, natural flavor), water, honey, mustard (vinegar, water, mustard seed, salt, tumeric, paprika), distilled vinegar, orange filling (orange, high fructose corn syrup, corn syrup, sugar, citric acid, fruit pectin, sodium benzoate), worcestershire sauce (vinegar, molasses, corn syrup, water, salt, caramel color, garlic powder, sugar, spices, tamarind, natural flavor, sulfiting agent) salt, corn starch, chili powder (chili pepper, spices, salt, garlic powder), spice, dried onion, garlic powder. I've never had Granny's BBQ sauce before. This order was based on other reviews. They were right!!. This is what I call top shelf sauce that gives you that bbq sauce taste you mouth craves. Yummy sweet sauce with a hint of boldness amazing on chicken. Recommended for your bbq chicken. I will order more before I run out!! I really like this sauce. It's a good standard BBQ sauce that everyone will like if you are feeding a crowd. Use it at home and when I cater on the side. I added Granny’s BBQ Sauce to my traditional Chicken Fajita dish and wow it added a totally new taste adventure, can’t enough. I love this BBQ sauce. This sauce goes on everything at my house, especially chicken. It's not too thick, not too thin, and has a nice balance of spices. Way better than any bbq sauce I can buy at the grocery store. Sometimes I get a free shipping from their email newsletter too.